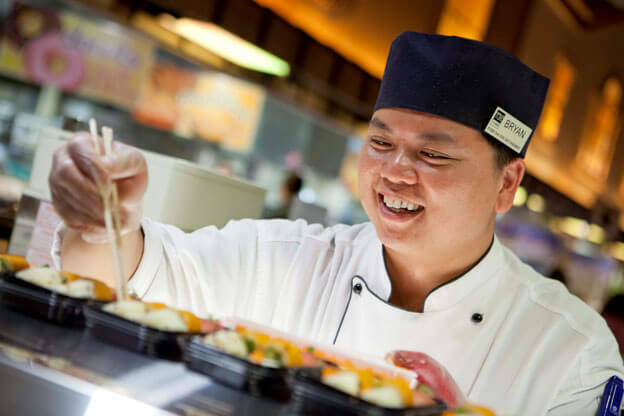 Bryan Kuo kicked off his Wegmans career at our Princeton, NJ store in December 1999. He has now been with us for 18 years, working his way up from Customer Service Member to Sushi Merchant. His current role allows him to fulfill his passion of teaching the art of sushi, while educating customers on the joy of eating it and sharing the health benefits of the Japanese cuisine. While joining the workforce as someone who wasn’t a native English speaker presented a challenge early in his career, Bryan has since found his fit within Wegmans, as he constantly learns through his experiences with the help of his amazing coworkers. What led you to take on this position? I started out at Wegmans as a Cook 3 (prep cook). In less than 5 years, I was promoted through various cook roles (Line & Lead Cooks) and into a Sushi Manager. There, I started working with Chef John Emerson on opening new stores, teaching sushi classes in cooking schools, changing new sushi programs, doing sushi festivals and helping to make some organizational changes within the Sushi operation at Wegmans. I also helped train employees in the art of making sushi while growing my own learnings in the Prepared Foods Area. Finally, in 2015 I was promoted to a Sushi Merchant. What is your day-to-day like at Wegmans? On a normal day, I manage the day-to-day operations at the sushi bar in our Cherry Hill store. This might include work like replying to emails and answering questions from the other 7 stores in the New Jersey Area. Frequently I help test out new sushi items and equipment as well as train other sushi Team Leads, Culinary Management Trainees and Chefs from other stores. I also travel to help support any sushi events and store openings. What I love most about being a Sushi Chef is teaching others the art of making sushi as well as educating customers on sushi’s health benefits and the enjoyment of eating it. What was your most memorable Wegmans experience? Working at Wegmans has opened many opportunities and experiences for me. My most memorable experience was going to Japan for a week of training in 2010. There, I was able to learn new sushi techniques as well as try exotic seafood such as Fugu (Fugu is the Japanese word for pufferfish and the dish prepared from it). What are your hopes and plans for career growth within the sushi department at Wegmans? When I was first hired, I could never have imagined I would rise to become a Sushi Trainer in the future. I hope in my career to become more educated in other cuisines; therefore, I plan to continue my training in other departments to learn their style of cooking as well as learn their ways of managing the department. What makes you excited to go to work every day? Making sushi is not only a job to me but also an art I thoroughly enjoy. By training new workers and educating customers, I feel accomplished and fulfilled that I get the opportunity to spread the art. Are you interested in joining our team and sharing the art of sushi with others? Brian has a few words of advice for you. “My advice to someone who wishes to join the Wegmans family is to be focused at their job and put effort into whatever they are doing,” he says. “But also enjoy the work as well!” If you’re interested beginning a new and exciting career that you will love with Wegmans, explore our openings!